SAN BERNARDINO, Calif. /California Newswire/ — The County of San Bernardino Workforce Investment Board is recruiting unemployed young adults, ages 18 to 24, for the launch of the Linking Innovation Knowledge and Employment project (@LIKE). @LIKE is a collaborative effort among three of the region's Workforce Investment Boards, San Bernardino, Riverside and Imperial Counties. The program serves young adults who have not been in school, working or serving in the military for at least 90 days. This initiative will address career challenges young adults currently face. Factors such as the high cost of post secondary education, competition with more experienced adults for entry level jobs, and a lack of awareness regarding career and training options. These issues have left young adults at a severe disadvantage. Funded by a $6 million grant from the U.S. Department of Labor Workforce Innovation Fund, the project will give participants the skills and credentials needed to secure and maintain employment. Recruitment is already underway for interested young adults who meet the entry criteria, and will continue for the three-year length of the program. Young adults seeking a high school diploma or GED, college counseling, job skills training or employment are encouraged to apply. Transportation and supportive services are available on a limited basis. Applications can be submitted to Emily Petrus at epetrus@wdd.sbcounty.gov. "The County's Workforce Investment Board programs help young adults gain the education and technical skills they need to enter the workforce prepared to succeed," Chair, Janice Rutherford, County of San Bernardino Second District Supervisor said. Roger, a young adult from San Bernardino County, knows firsthand the challenges of the current economy. After facing steep competition with more experienced workers for entry-level jobs, he entered a program similar to @LIKE, funded by the County of San Bernardino Workforce Investment Board. Although he considered college, he could not afford it and felt he had no options. Roger attended workshops and was placed with a career counselor. His career counselor introduced him to a construction training program, which gave him the skills needed for employment. "Like Roger, many local young adults face overwhelming obstacles to employment," said Sandy Harmsen, Executive Director of the Workforce Investment Board. "The @LIKE program will offer college and employment preparation workshops to enhance basic skills, assist with academic credit recovery and explore career options." A case manager will partner with each participant to develop an educational and career plan, foster career development and coordinate individualized services. In addition, each participant will have a life coach to help with personal issues and individual growth. Paid work experience, occupational skills training, internships, and entrepreneur workshops are also available as part of @LIKE. Roger shared how the Workforce Investment Board program impacted him. "It helped me realize I have great potential. The training I received has allowed me enter a career field I'm passionate about and pursue professional opportunities I never knew were available. I am very thankful for this amazing program." For more information about the @LIKE program call (909)387-9859 and ask to speak with a Youth Team member or email epetrus@wdd.sbcounty.gov. To apply, visit http://www.atLIKE4U.com/ . 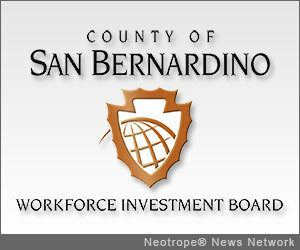 The County of San Bernardino Workforce Investment Board (WIB) is comprised of private business representatives and public partners appointed by the County of San Bernardino Board of Supervisors. The WIB strives to strengthen the skills of the County's workforce through partnerships with business, education and community-based organizations. The County of San Bernardino Board of Supervisors is committed to providing County resources, which generate jobs and investment. The WIB, through the County of San Bernardino's Economic Development Agency and Workforce Development Department, operates the County of San Bernardino's Employment Resource Centers (ERCs) and Business Resource Centers (BRCs). The ERCs provide individuals with job training, placement and the tools to strengthen their skills to achieve a higher quality of life. The BRCs support and provide services to the County's businesses including employee recruitment. Employers and job seekers who are interested in the Workforce Investment Board programs may call (800) 451-JOBS or visit http://www.csb-win.org/ .